The Sapphire Brides has been a lovely series so far from Tracie Peterson. I love that she takes the reader into the wilderness of Montana. She's always taking us into the rough countryside! This is the second book in the series I've been able to review thanks to Bethany House! A beauty refined is very different from A Treasure Concealed (Book 1 in the series). This time the people who are looking for sapphires in Montana are from Germany. When I first started the book, I shared on Instagram that I was already antsy about the storyline by like page 12. Tracie had started off the story with me chewing my nails and immediately wanting to flip to the end of the book. Not kidding. THANKFULLY, Tracie addresses the initial situation almost immediately. Whew! Phoebe Von Bergen, the daughter of a German count, is excited to visit America for the first time while her father purchases sapphires in Helena, Montana. Little does she know, however, that her father's intentions--both for her and the gemstones--are not what she thinks. Ian Harper, a lapidary working in Helena, finds the dignified young woman staying at the Broadwater Hotel more than a little intriguing. Yet the more he gets to know her, the more he realizes that her family story is based on a lie--a lie she has no knowledge of. And Ian believes he knows the only path that will lead her to freedom. This was an interesting read for me. Book 2 in the Sapphire Brides series isn't a continuation, and could easily be read on it's own. I'm guessing book 3 will follow the same path. 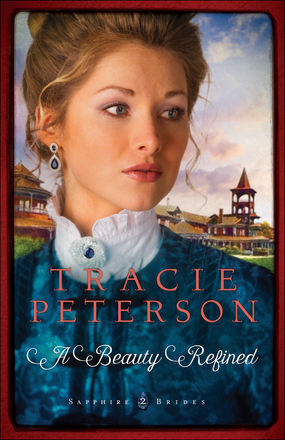 Having ready quite a few of Tracie's novels over the years, this one seemed different. Like her writing style was different somehow. I couldn't quite put my finger one it. I liked the storyline, and the characters. Well, I might not have liked Phoebe's dad very much. lol He's not supposed to be likable though. Ian I wasn't a fan of to begin with either, but I began to warm up to him as the story continued. If you want a book that dives into unhealthy family dynamics and reconciliation as well as adventure, this book would be right up your alley. Tracie always brings history to into her stories in a way that makes you wish you were there living it with her characters! I'm looking forward to book 3 coming out this fall!